A Japanese radar reconnaissance satellite rode into orbit atop an H-2A rocket Monday, expanding the country's capacity to observe military and civil developments around the world. The satellite lifted off at 0121 GMT Monday (8:21 p.m. EST Sunday) from the Tanegashima Space Center, Japan's primary space launch base on a remote island at the southern end of the main islands. Launch was at 10:21 a.m. local time in Japan. The two-stage H-2A rocket, fitted with two solid rocket boosters, soared into a clear sky and delivered the satellite into orbit about 20 minutes later. 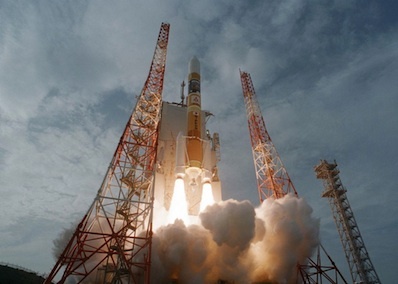 The Japanese space agency, JAXA, announced the launch was a success. It was the 20th flight of the H-2A launcher, and 19 of the missions have been flawless. Japanese officials have not revealed the capabilities of the satellite, but it carries a synthetic aperture radar instrument designed to see through clouds and take pictures on the night side of the Earth. Japan has four optical spy satellites in space, including a new craft launched in September which is not yet operational. The last of Japan's radar satellites failed in orbit last year, leaving the country without an all-weather satellite reconnaissance capability. Kyodo News reported the development of the new radar satellite cost 39.8 billion yen, or about $512 million. Kyodo said the launch cost $132 million. Data from the Japanese spy satellite program is used by the government to keep track of North Korea's nuclear and missile programs, along with other military movements across the globe. The imagery was also crucial in the aftermath of the March earthquake that spawned a devastating tsunami and the following crisis at the Fukushima nuclear power plant. Another radar satellite could launch next year on an H-2A rocket. The next H-2A launch is scheduled for the spring of 2012 with a Japanese climate satellite and a South Korean remote sensing craft.